They said it couldn't be done. Well, it has been done, proving them wrong once again. 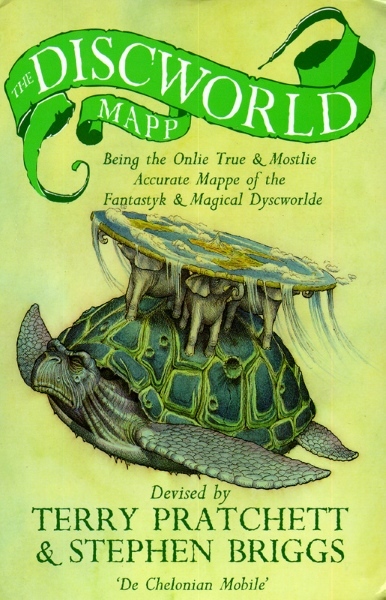 After years of research, cunningly contrived in as many minutes, the Discworld has a map. It takes full account of the historic and much-documented expeditions of the Discworld's feted (or at least fated) explorers: General Sir Roderick Purdeigh, Lars Larsnephew, Llamedos Jones, Lady Alice Venturi, Ponce da Quirm and, of course, Venter Borass. Now travellers on this circular world can see it all: from Klatch to the Ramtops, from Cori Celesti to the Circle Sea, from Genua to Bhangbhangduc. The great cities of Hunghung, Pseudopolis, Al Khali and, of course, Ankh-Morpork are placed with loving care upon this world which is carries through space by Great A'Tuin.